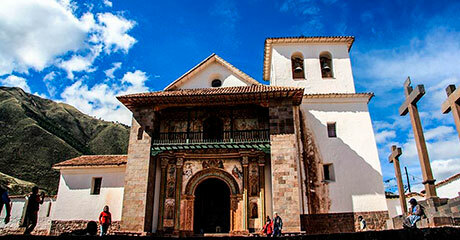 This tour is known for combining beautiful natural landscapes, Inca architecture in Tipon, pre - Inca Wari architecture in Pikillacta and a beautiful chapel, known as the "Sistine Chapel of America"
TIPON: Tipon is said to be a royal garden commissioned by Wiracocha. It is one of the most elaborate examples of agricultural terracing created by the Incas. These tall terraces which run up the narrow valley are irrigated by an aqueduct from Pachatusan, the mountain above the site. Cusco area. This adobe complex was built around 700 to 900 AD by the Huari, in the area, there is a small Inca site just a short walk from Pikillacta, known as Rumicolca, a travel checkpoint for the Incas. ANDAHUAYLILLAS: Here you find the "Sistine Chapel of Peru", a church that is home to golden altars, paintings and many colored ceilings. The chapel is simple and unassuming on the outside, but on the inside you'll find masterpiece after masterpiece. On the return pass Saylla typical Cuzco where people can enjoy the delicious pork chicharrones (optional). We returned to Cusco for approximately 15:30 hrs. Pick up from hotel to start our trip. Professional bilingual guide (English / Spanish). Travel and Tourism Agency "Machu Picchu Travel"